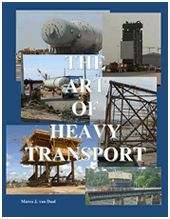 The Art of Heavy Transport offers over 400 pages of background information, both mathematical as well as historical, in easy to understand English language. It contains hundreds of color pictures of actual executed transports that aid the understanding of the various subjects. It is also illustrated with many drawings that explain topics such as hydraulic oil flow, axle groupings and the principles of transporter stability. While being of interest to the heavy transport enthusiast, it is of real value to the heavy transport professional.